WLM Work-a-Holics Landscape Management, Inc. It's all about the............. "Quality you can See!" 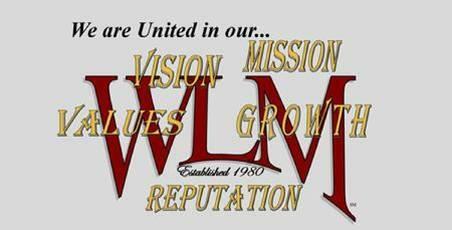 WLM is celebrating 30 Years! Since 1980 we have the great pleasure of providing our services for customers who have been with WLM, some since day one! We have built relationships working together so that they are completely satisfied with us and our service, so much so that they have stayed with us. Communication is key and a lot of hard work has gone into maintaining this level of communication and service. We have developed long term relationships with our employees, some working with WLM for 20, 25 to 27 years! We do not take this for granted and appreciate their commitment to WLM and in turn continues to motivate us to provide a workplace where they can be a part of an energetic and thriving company. Many issues have hit our industry these past years and we realize that we must keep our nose to the grindstone and stay doing what has brought us these past 30 years. For us, that is good old hard work, that at the end of the day we can say we were productive and accomplished our goals. With material for pest control, fertilizer and the ups and downs of fuel pricing we have worked hard to reduce our costs and lower our prices to be cost effective for value and quality. We do not take the current economic situation lightly and we want you to know that we want to keep you as a customer! As a customer of WLM you have the peace of mind and confidence to know that WLM offers you the experience of thirty years and the knowledgeable staff that includes a Turf grass Management Specialist, Certified Pest Control Operator who plans out a pro-active, environmentally friendly and safe Fertilization and Pest Control Program. Our Irrigation and Pest Control Technicians receive continuing training on correct procedures and up to date products. The WLM Managers are certified as Florida Certified Horticulture Professionals and our monthly WLMU (WLM University) training sessions provide instruction for all Crew Leaders and Crew Members in Best Management Practices (BMP) to maintain landscapes environmentally sound for a cleaner, safer environment. We are always looking for opportunities to seek out new and interesting products or services. When a new product or technology comes into the market, we are on top of it, learning and training to bring the product to the customer resulting in current and up to date knowledgeable and professional service. WLM receives instruction from the University of Florida for education and research and recommendations for maintaining landscapes horticulturally correct. WLM is a member of, among others, Florida Nursery Growers and Landscape Association (FNGLA) and Florida Turf Grass Association (FTGA) organizations which we look to for professional direction in our industry. Please, if you have a specific need, we can address it and together work it out. If you are presented with a bid that says it can produce the same product and quality, let us know and we will work on the specifications with you to determine if it is a bid that is comparable. Let us know what you want for your landscape and give us a chance to produce it for you at a price you agree to. It has been an amazing thirty years and we place our hope and hardwork in the next thirty with a continued commitment to excellence! Established in 1980 Work-a-Holics Landscape Management, Inc.is committed to providing consistent excellence in landscape care. WLM maintains the importance of high standards and values in the day to day business and handling of our customers, suppliers, and WLM family members(employees). We strive to be that which will settle for only the very best in customer service, maintaining that consistency in customer satisfaction is key. In 1974 at the age of 18, with no money but the lessons on faith and fortitude, I moved to Naples. After working several different jobs I began working for Judd's Lawn Service. From there began working nights and weekends picking up lawns here and there until finally going full time with Work-a-Holics and attending college at night. The year or two before WLM came to be, I was guided along the way by two more amazing people (referred to as �Mommer and Popper,� Popper has since passed way). To them, giving a person an opportunity is trading material to pass on to others and flowers are known as �Smilers.� They were kind enough to let me rent an apartment from them. On days when we would meet as I walked to my apartment door they would always take a moment to stop and offer encouragement. Always reassuring me that I could do it. When no bank would look twice, (said I was a bad risk) Popper was there to help with a loan for our very first truck. Previous to the purchase of this truck I was carrying the mower in a beat up old Toyota Station Wagon. They always had my best interest in mind and straightened me out when I needed it. Looking at WLM today we see all those off shoots of that trading material. 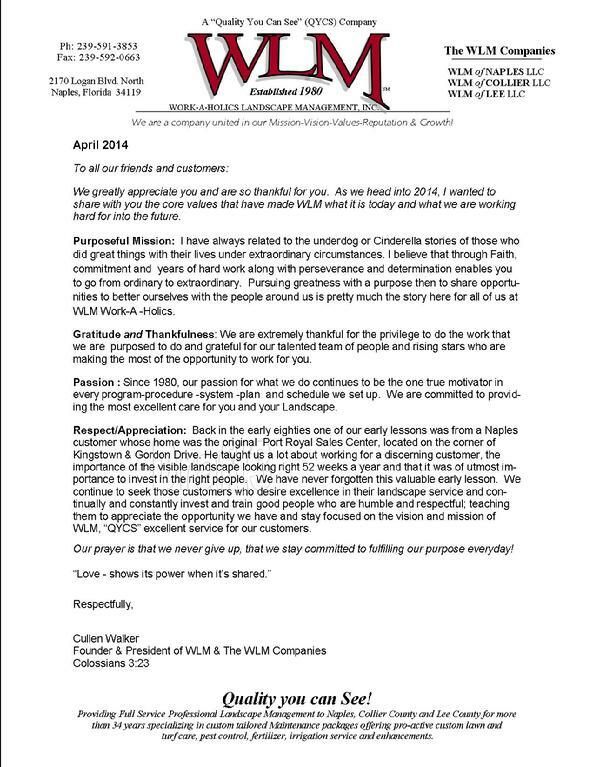 We are blessed to have customers and friends that have remained loyal to WLM year after year. (some since 1980!) What a thrill it is to be able to pass on opportunities ,Trading Material, to grow and see those seeds of faith and fortitude mature in them. As we look with excitement to the future, new opportunities are being developed (Trading Material) for growth. Our goal is to continue to raise our level of service and maintain stability and confidence in present and future customers and friends. We encourage you to look at the trading material in your life. Watch for all the off shoots that have and will come out of a little good, if you pass it on!